the tbl2cad is Microsoft Excel (2007, 2010, 2013 and 2016) add-in to export Excel tables to the DXF file format (as lines & text objects) as well as to import DXF tables containing the line & text objects to the Microsoft Excel table. 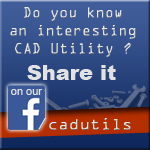 The add-in is CAD independed and you can process your tables independent to your actual CAD system. There is avaiable also free version. The free version of tbl2cad writes the text "Free version" instead of your text and it is designed especially to test the add-in with your Excel. Anyway - the free version can be also used to export the Excel table geometry (includuding the text sizes & position) to the DXF file.